The Brookline Historical Society is a non-profit community organization dedicated to the preservation and interpretation of Brookline's diverse history. The society's headquarters are located in the heart of Coolidge Corner at the Edward Devotion House, one of Brookline's oldest colonial period structures. The Society also maintains the circa 1780 Widow Harris House as well as the Putterham School located in Larz Anderson Park. Our membership program is active and volunteers are welcome. We invite you to browse our growing online collection of over 700 historic photos, postcards, atlases and more. 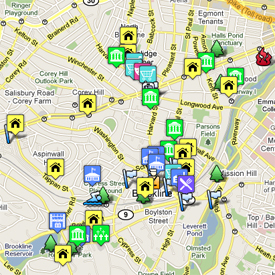 Brookline's rich history can now take a virtual walking tour of the town via our new online map. 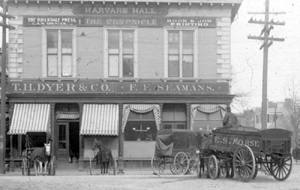 The map presents pictures and descriptions (with links for more information) about homes, commercial buildings, churches and synagogues, schools, neighborhoods, parks, and other parts of the town. Most of the sites marked on the map are in Brookline Village, Coolidge Corner, Longwood, and the area around the First Parish Church and the old Village Green. Other sites and other areas of Brookline are being added, helping to bring to light stories behind familiar and not-so-familiar places in town.